Need a retreat? Come get away from everyday in this stunning 3-bedroom cabin tucked into a mountainside in the heart of the Aska Adventure Area. Away from Everyday is your go-to, when it comes to looking for that perfect place for your next relaxing getaway or family vacation. Located on over 5.5 acres in a tranquil mountain setting, privacy and convenience dance hand in hand. Feast your eyes on the long range mountain views as you relax on the porch and listen to the sounds of nature. Walk through the front door and immediately feel immersed in the essence of mountain living as the floor to ceiling stone fireplace towers above you. Enjoy a cozy fall or winter evening in front of a crackling wood fire as you read your favorite book, or snuggle with your loved ones. The fully-equipped kitchen invites the chef of the family to create culinary masterpieces, of which you can enjoy at the dining room table while you stare outside at the mountains, like mounds of earth reaching for the soaring sky. Your slumber needs are met in each cozy and tastefully decorated bedroom. The entry level offers a Queen bedroom with a bathroom across the hall, complete with a tub/shower combo.The Upper Level boasts the King Master Bedroom with a 40" Flat Panel TV and Private balcony with hammock a view! Just outside this bedroom sits a spacious loft with a custom built-in office nook. Take some time in the loft to scan through the DVD library offering 200 movies. Just off the loft find the master bathroom with a tub/shower combo. On the lower level a 3rd bedroom awaits with 1 set of bunk beds. 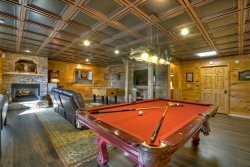 Added entertainment to this level includes a 55" Flat Panel TV in the Den/Game Room Area, an air hockey table, and comfortable seating. Venture outside where you can soak your tired bones in the hot tub while you enjoy the songs of nature. Or gather around the fire pit and share your stories of new adventure and life experiences with your closest friends and family. Located in the Aska Adventure Area on 5.5 acres, 10 minutes from downtown Blue Ridge Shopping and Dining and a 10-minute drive to Toccoa River Activities. Most wonderful place to stay! Wonderful time . Perfect cabin . Thank you ! The view is exactly as pictured!! Absolutely beautiful and quiet. Loved our stay here. Was exactly what we were looking for in a cabin, and in a weekend getaway with friends. Will definitely be back next year! Very friendly. Offered great recommendations. The only thing I would consider adding to this property is a light over the kitchen sink. It is very difficult to see when washing dishes, preparing food, etc. Start-up supply of paper products, trash bags, soaps, and basic cleaners. A fully-equipped kitchen for preparing and serving meals.